Total Training has given us an exclusive 20% discount coupon, and we've been told that this coupon can also be applied to the already heavily discounted Creative Suite 2 Premium Edition Bundle. 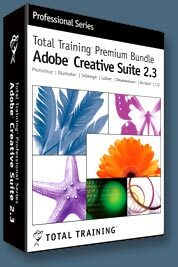 This bundle of DVDs teaches pro level tips and techniques for Photoshop CS2, InDesign CS2, Illustrator CS2, GoLive CS2, and Acrobat 7. Regulary priced at $1,179.94, it's on sale right now for $449.99, saving you $729.95, and when you add on our coupon you save an extra $90. To redeem our exclusive discount coupon, use promotion code save20pss in your shopping cart and you'll receive a full 20% discount on this already crazy price, so that the entire CS2 Bundle (10 DVDs) costs you only $359.99. This bundle has over 88 hours of training. Use this special link to see the full offer.